This story originally appeared in the December issue of Hail Varsity. You can subscribe here. On Fridays and Saturdays, Scott Frost and his closest friends on his Wood River (Neb.) High School varsity football team would meet up in the basement of his house and play cards. In a town as small as Wood River, with fewer than 1,500 people, there’s not a lot to do anyway, but Frost and friends wanted to stay out of trouble. So, as often as possible, everyone would round up all the dimes and quarters they could find, jam them into a piece of Tupperware and head over to the Frosts’ for poker. No one ever ran the table. One night Codner would leave with $10 in earnings. The next night, Frost would leave the big winner and someone else the night after that. It all just kind of passed around. The boys didn’t really play for money though – even though it was nice for a bunch of high school kids – as much as being around each other and having a good time. 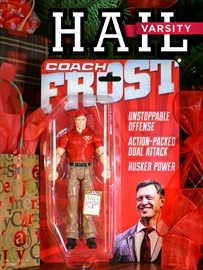 In the 20 years since those nights spent around a fold-up table, Frost has won a national championship at Nebraska, played in the NFL, been a finalist for the Broyles Award as the top assistant coach in the country, become a head coach, led an undefeated season, been the national coach of the year and returned home to the place where he began his journey. No one really knew what Frost was going to do until he signed a seven-year, $35-million contract with Nebraska on Nov. 27. Or maybe some did. Not much has changed from his Wood River days. Codner still remembers the first time he met Scott Frost. It was the summer of 1989 and Frost, along with his parents and his brother, Steve, had just moved to town. Frost’s father, Larry, was taking over as the head football coach and Frost was getting set to enter his freshman year of high school. Frost was a threat to the upperclassmen at first, being not just a new kid but also the coach’s son. “The guy who played quarterback knew his job was gone,” Codner said. But more than that, the football team around Frost was trying to adjust to a new culture. Every day was scheduled out, every practice scripted. There was a set timeframe for each individual drill and there was a defined end-point for practice each day. Before, the team could practice for hours one day and then see that time cut in half the next. But with Frost’s father running the show, things were different. “Everything was boom, boom, boom,” Codner said. That’s probably where Frost’s nature came from. Ben Egger, a teacher and assistant coach during Frost's time in Wood River. In Egger’s class, there was a healthy amount of debating over the hot-button political issues of the time. Frost could and would play the role of devil’s advocate, arguing a side he didn’t believe in just for the purpose of the debate, but Egger said you’d never know it by the way Frost prepared. Frost had a teammate and friend in the class, and Egger said they would go two-on-all. “Any angle you’d want to come at them, they would take that challenge,” Egger said. To most of his teachers, Frost was the perfect student. The high school football star has a stereotype, a big-man-on-campus type that doesn’t excel in the classroom the same way he does on the field. That was not Frost. Egger never had any disciplinary issues with Frost, and he never missed any homework. Egger’s class had a rule that if you missed an assignment, you stayed late to make it up. Doing so would have messed up Frost’s schedule, messed up the structure, so he never did. By everyone’s account, Frost was a straight-A student – after all, he did get accepted to Stanford – and did everything he was supposed to do. He took every advanced class at Wood River he could. He even wanted to take an advanced calculus class that the school didn’t offer, so Codner said his mother, Carol, who was a junior high math teacher, would come teach him calculus during last period. The analytical thinking came from his mother, Egger said. Frost was always thinking ahead and calculating each move he made. But, he had a creative side, too, one that came from his father. Where the structured side of his brain manifested itself on the practice field and in the classroom, the creative side came out between the lines. Egger, who was also an assistant on the football team and the assistant head coach of boys’ basketball, said Frost was everything you wanted in a quarterback because of his mind. Even now, Frost is the same way. When he was introduced as the Huskers’ next head coach, Athletic Director Bill Moos praised Frost’s mind and his approach to the game. No one out-prepares him and no one out-works him. 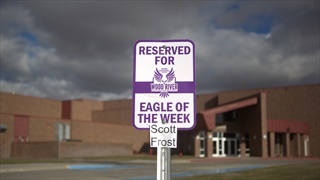 After being hired at Nebraska, Frost earned makeshift Eagle of the Week honors at his alma mater. Nielsen said a handful of the plays in Frost’s playbook, from back during his Oregon days and during his two-year run in Orlando, came from Wood River. They worked then, they’ll work now. Frost wrote a blog post in 2005 in which he talked about system – among many other things – and said anything can work with the right coaching and the right players. At every stop along the way, Frost has made sure he’s had the right ingredients for success. “He’s always thinking ahead,” Nielsen said. During their time at Wood River, Codner, Spiehs, Nielsen, Frost and the rest of the team would go to Valentino’s for pizza every Thursday night before a football game as a team-unity exercise. After practice the entire team would make its way to Grand Island and eat their pregame meal. After, they would go to Conestoga Mall and either walk around and just enjoy each other’s company or see a movie. Spend any time with Frost and one thing becomes abundantly clear early on: family is everything. But not just immediate family; Frost develops deep bonds with and cares about anyone that comes into his life, from friends to teammates to co-workers. When Frost transferred back to Nebraska from Stanford, Egger said he came by the school to see some of his old friends. When they met, Frost told Egger that he learned more in his political science class than he did at Stanford. As time went on for Frost at Wood River and his star grew and the world outside Wood River started to take notice of his athletic abilities, Nielsen said practices turned into media circuses. Local TV crews were always there, ESPN visited when Frost was named Old Spice Athlete of the Month and Sports Illustrated did a big spread on him. There was a revolving door of college coaches in to see Frost, and as time went on, his weekends filled up with phone calls and visits. 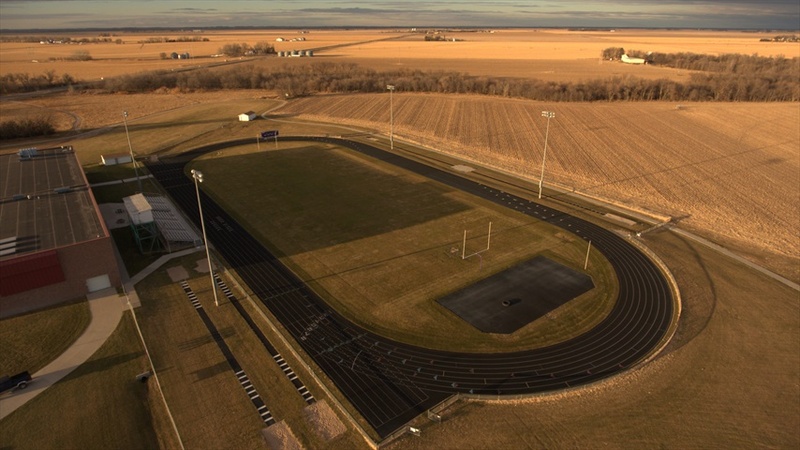 The track and football field at Wood River High School. When Frost was set to announce his decision to go to Stanford, Codner said he went to his English teacher and asked how to conduct himself during his announcement. He didn’t want to come off cocky or arrogant and he didn’t like all the show, he just wanted to say what he wanted to say. When people came up to Frost wanting autographs, Nielsen said Frost stopped every time. But he remembers Frost doing it not out of obligation. Each time a fan came up to him, Frost made sure to ask them how they were, ask how their day was going. On Nov. 4, Spiehs and a friend drove to Dallas for the Central Florida-SMU game to see Frost. They couldn’t leave earlier than Saturday morning, so they left bright and early at 4:15 a.m., and Frost still made time to see them after the game. When he had free time in high school, he helped neighbors on their farms. Nielsen remembers Frost helping him and his uncle move square bales of hay on their farm. Spiehs said Frost – along with his brother, Steve – needed a summertime job when he moved to town, so he went to work on their farm and did everything from laying irrigation pipe to painting miles of feed-yard fence. Six years ago, Spiehs, Nielsen and Codner all went to Boulder, Colorado, for an Oregon-Colorado game. At the time, Frost was coaching wide receivers for the Ducks, and the group was excited to see their friend again, but they weren’t quite sure what they were going to be walking into. Egger remembers a game at Boone Central when Frost was quarterbacking the Eagles. He doesn’t remember when the game was and he doesn’t quite remember the score, but he said they entered halftime down several touchdowns. So Frost came out in the second half, as it started to snow, and exploded for three scores in all three phases of the game in quick succession. Egger said Frost broke an option play on offense for a big score, took a return to the house and picked off a pass on defense that he also returned for a score. 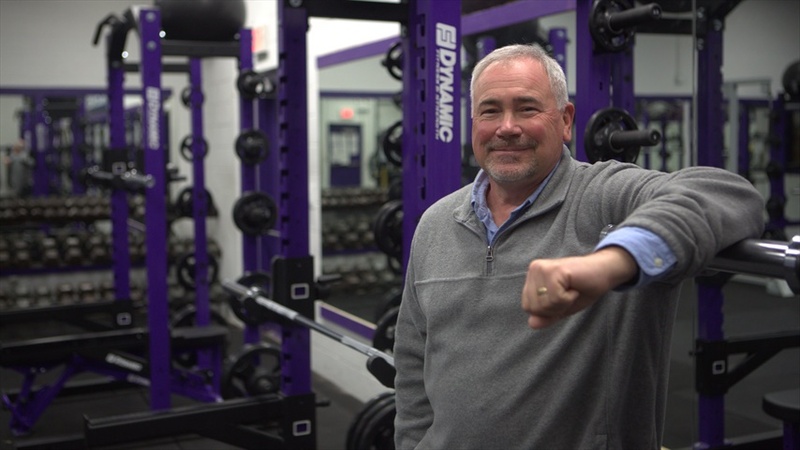 When Frost was at Wood River, he did everything. He was a football star, but he also was a state champion at shot put and hurdles; he played point guard for the varsity basketball team and played a little baseball on the side. 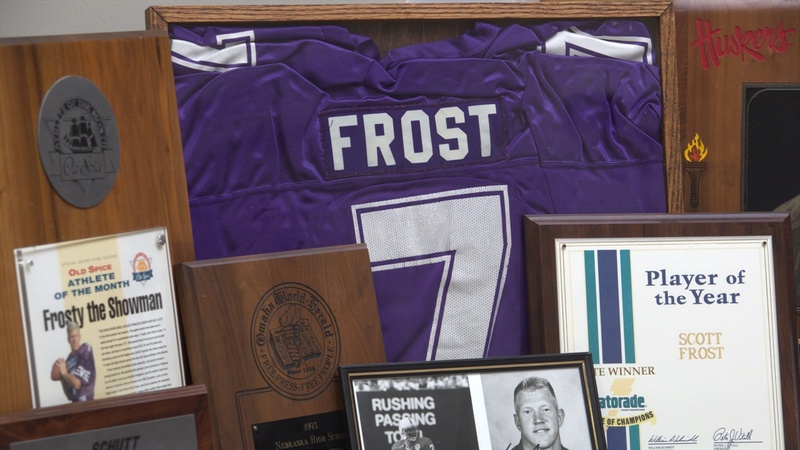 Frost currently owns Wood River school records in rushing yards in a season, passing yards in a season, total yards in a season, career completions, career touchdowns, career passing touchdowns, career rushing yards, career passing yards, career total yards and shot put. Nielsen even has a picture of Frost and them playing in a sand volleyball tournament at the Wood River Fun Fest. Nielsen and Codner both joked that Frost never had a serious girlfriend in high school; athletics came first. There were dates here and there, but Frost was focused on the field. 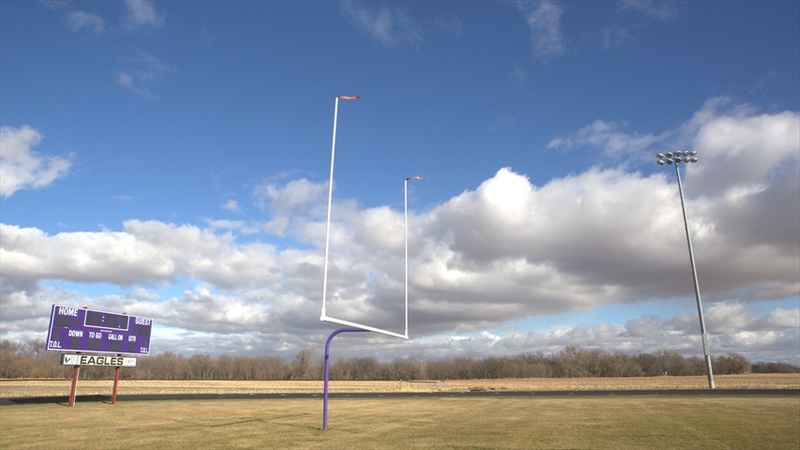 The team would go out to the Wyoming Cowboys football camp every year and compete with schools well outside their class. Their senior year, they even won. Frost was that talented. The Dec. 2017 cover of Hail Varsity. No one has any doubt Frost will be successful as the Huskers’ new coach. Frost is the type of guy that can get players to play harder and get a team to reach its potential, Egger said. None will be surprised if the Huskers are competing for Big Ten championships in a few years. For the most part, the fame and attention haven’t changed all that much about a quintessential All-American small-town boy from Wood River, Nebraska, as Spiehs calls him. He’s still the same guy that took Codner’s poker money. He’s still the same guy that signed a plate for Nielsen’s grandmother before a game. He’s still the same guy that Spiehs would see reading his Bible when he went over to his house. Still the same guy that Egger saw completely change the complexion of a football game on a snowy day back in high school.